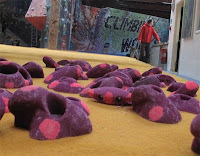 After our new green circuit last week, we've moved up a few grades and started work on a new purple spotty cirucit. The old circuit has been stripped and cleaned (with the magic that is Benky Grip Wash) and we have our guest route-setter, Neil Mawson, currently setting a few problems today. The whole circuit will be finished tomorrow once the holds have dried overnight. What this all means is that by Tuesday night you will have a new 40 problem circuit in the Font 6c-7a grade range. 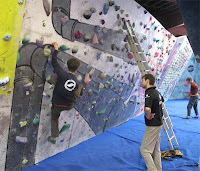 Percy testing some of Neil's new problems. In the background is ex-pat/Spanish resident Pete O'Donovan (POD) realising how Spanish limestone just doesn't measure up to the beauty of The Climbing Works.